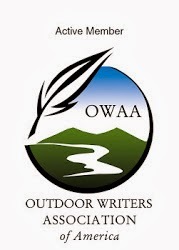 This evening the Outdoor Blogger Network selected the winners of their 2012 Blogger Tour. Marc and I won! I'm still stunned. 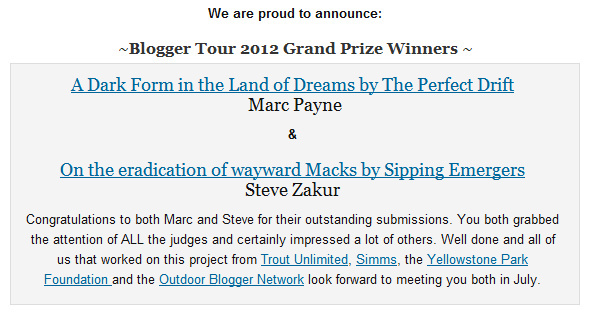 You can read Marc's entry, A Dark Form in the Land of Dreams as well as mine. Ya!! that's awesome and so well deserved! Excellent! And wasn't the countdown delicious torture? It's a strange experience. For the first three hours or so you're hoping not to win. Then, you want it all! Very sweet. I'm over here to personally congratulate you on the win. I'm very excited for both you and Marc and I can't wait to meet you both in July. I had no idea that you two were 'close' in the sense that we become on the Internet, so to discover that now is just icing on the Yellowstone cake. Thx Rebecca. Yeah, Marc and I have been corresponding back and forth for the past year. We've been meaning to get together and fish but it has never worked out. Now it will! Well Steve, congrats to you and Marc on the big win. Take lots of pictures. No, seriously, a good piece mister. Important, too. Well done.